Home / What is the difference between a septic tank, sewage treatment plant and cesspool? What is the difference between a septic tank, sewage treatment plant and cesspool? If it is impractical or impossible for you to connect your property to the mains sewer line, you will need to have an alternative means of sewage disposal and treatment. There are three main kinds of system which are used in the UK for this purpose and, in this article, we’ll take a look at what these are. A cesspool is just a large watertight tank, buried underground, which collects sewage and wastewater from a property. 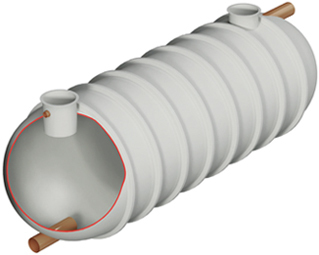 Cesspools are effectively just a storage tank and do not treat the waste or filter it out into the ground in any way. As such, they need to be frequently emptied – around once a month – which can be quite costly. Nowadays, they are quite rare and only tend to be used as a last resort. Septic tanks are a kind of system for treating wastewater which utilise natural processes and bacteria. The system is comprised of a septic tank and a drainage field, both of which are situated underground and have to meet various regulations regarding placement. The septic tank needs to be emptied periodically – roughly once a year, depending on usage – but nowhere near as frequently as cesspools. In a typical septic tank system, sewage from the property flows into the tank and naturally settles into 3 layers. Heavy solids and sludge sink to the bottom of the tank, scum and organic solids rise to the top where bacteria will break it down, and effluent water sits in the middle. The effluent water is then released into the drainage field and filters through the soil where natural bacteria break down remaining waste particles. Small sewage treatment plants are an efficient choice for a property’s wastewater treatment. They are comprised of three chambers and the wastewater which is discharged at the end of processing is notably cleaner than from a septic tank, allowing it to be released into watercourses or ditches. The system requires an electricity supply and has to be serviced annually but can generally be emptied of sludge buildup less frequently than septic tanks. Sewage treatment plants operate in a similar way to a septic tank, but with the addition of extra treatment chambers. The first chamber acts much like the septic tank. In the second, the wastewater is mechanically aerated and aerobic bacteria further break down the waste. The final chamber is another settlement chamber where fine waste particles settle before the effluent, which by this stage is roughly 95% clean, is released. If you require a wastewater treatment system and expert advice, the professionals at Wildon UK are happy to help. With many years of experience and a skilled team of operatives, you can trust in Wildon UK to provide high quality installations, maintenance and repair work for many kinds of system. Get in touch with our team today with any enquiries – we operate in Stoke-on-Trent and across the UK.